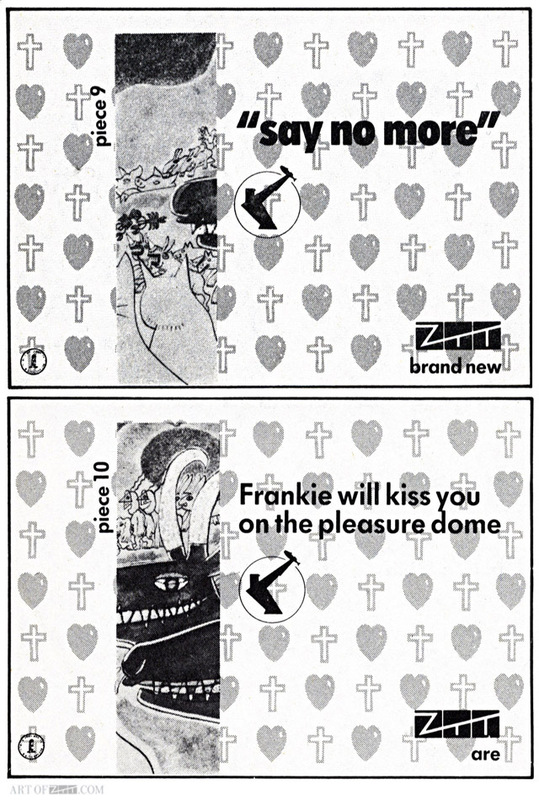 artist: Frankie Goes To Hollywood title: Welcome To The Pleasuredome format: 1/8 pg Record Mirror advert design: XLZTT illustration: Lo Cole cat. no: ZTT IQ 1 date: 27/10/84 art of notes: This was the ninth and tenth of 12 adverts that appeared in various music papers in the two weeks prior to the release of the album. Each piece contained a slice of the inside gatefold image by Lo Cole that would form the entire image if folded and placed together. Two pieces appeared each week, usually on different parts of a page or spread but I’ve put them together for each post relevant to the issue they appeared in.